Go Rhino is ushering in a new, refined front and rear bumper. These bumpers are made from 3/16” thick steel and laser measured for an exact fit. 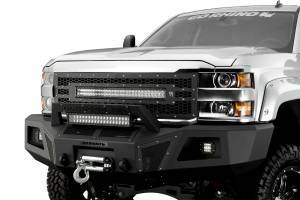 Each front bumper can be installed with or without a winch depending on your needs. Go Rhino 5 year warranty on truck bumpers is the best in the industry. You will noticed the angled designs allow for additional ground clearance, an added benefit for off road driving. Additional side support brackets guard against vibration and front & side impacts and rugged box design ensures that Go Rhino bumpers are not damaged during shipping.